This information helps extension practitioners assess whether they are reaching their target audience and evaluate, plan and continuously improve their extension websites, to ensure they are reaching their extension goals. 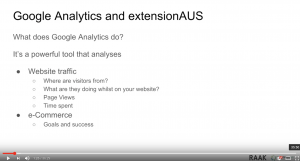 The extensionAUS program (www.extensionAUS.com.au) recently ran a webinar explaining to extensionAUS practioners, how Google Analytics can be used to monitor, analyse and evaluate the websites that they use for extension. Regularly updating your website content, along with a good system for search engine optimisation, will keep your site higher up in the rankings of search engines and therefore much easier to find. Regularly updating the content, shows your target audience the site is active, timely and relevant. In this day and age, this is important for proving the credibility and importance of the site to users. Users will quickly click away if your site is not active and if it is clear that it is not being maintained and is not current. As so much information is available online, your target market is looking for a point of difference in how your site can meet their information needs. This point of difference is the value proposition of the website and it will include the site being relevant, trustworthy, timely and interesting. Regularly updating to ensure your content has these characteristics, is critical to growing and retaining your audience. It is absolutely critical that Google Analytics is properly configured for the website in question. In Google Analytics, a visitor to a website is referred to as a “User” and they are identified by their Internet Protocol (IP) address. An IP address is the identifying number for an internet device that allows them to communicate on the internet. Like physical addresses, an IP address will show the location of the device. When a User visits a website, Google Analytics then monitors them, using the IP address of the device they are on. It is a unique measurement, in that when they return to a website, they are then identified as a return User. Each time a User engages with a website, is called a “Session”. A Session is when a User is active on a website. If a User is on a site, but is inactive for 30 minutes; whenever they are active after that, will count as a new session. 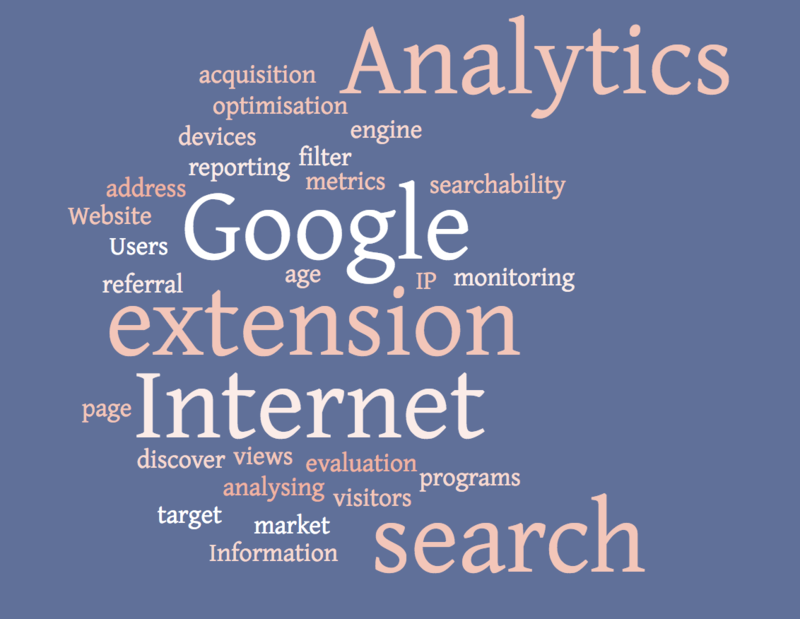 Google Analytics measures the duration of each Session. 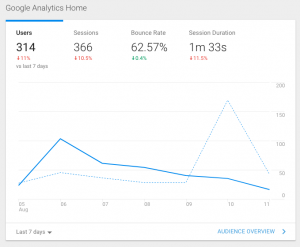 Google Analytics monitors Pageviews and Pageviews per session. A Pageview is when a page on a website is viewed within a session. Pageviews/Session, is the average number of pages per session on the website for a given period of time, i.e. per day, week, month, year or for a designated time period. Bounce rate is another key Google Analytics metric. It gives the percentage of one page viewed sessions, i.e. when a User leaves a website after viewing only one page in a session. A Google Analytics Account is your point of access to Google Analytics. When you open your account, it will open in the Admin section and show the Properties and Apps you are monitoring and the Views. A filter is the way data in a view can be segmented into smaller subsets called segments. This allows you to drill down into your data and provide specific reports to meet your information needs. The default view is “All Web Site Data”. When you click on that, it will show the last seven days of website traffic. The number of users, sessions, the bounce rate and session duration for those seven days. The time range can be changed by clicking on the drop-down box in the left-hand corner of the display box. Where users are from is shown by country, the time of day they visit is also shown, as is the device they are using to view the website. Each of these areas can be drilled into further by clicking on the link to their drop-down boxes. These can be found by noticing unusual spikes in any of the statistics. 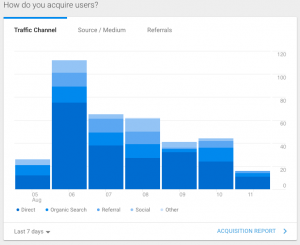 Analyse the Users origin or Acquisition origin data, to see where the traffic is coming from. Then you can create filters to exclude traffic that is skewing the results. Note that when people visit your site using different devices. E.g. they visit on a desk top computer and then visit again on a mobile phone, they will be counted as an individual User each time. When they are really the same User, but on different devices. Active Users, Bounce Rate, Page Views and Average time spent on a page are all good indicators as to whether your site is being used effectively. For instance, a high bounce rate with a low session duration, may indicate that people are arriving at your site, but not engaging fully and really reading the information on offer. For blog type websites, a bounce rate of 40 – 60% is seen as reasonable, but obviously if pages have low time spent on them, this is an indication that users are not engaging with and using the content. Acquisition will show how Users are reaching the website and Mobile Overview will show you the devices that are being used. For instance, if you are directing people to particular pages using a social media campaign, then a high bounce rate may well be acceptable. If it is associated with the pages that the campaign is about and the page is being viewed for a long enough period of time that you can infer it is being read. Creating Custom Dashboards (see create and customise dashboards) and Reports using Custom Alerts (see create and manage custom alerts) and setting Goals (see create, edit and share goals) are all good ways of personalising Google Analytics to get the information that you need. Using Filters to ensure your Reports are reporting what you need is important. By setting Goals and then measuring Conversions against the goals, gives greater insight on whether the extension goals for a website are being met. Data is only good if you use it. Set up key times that your Google Analytics reports are to be reviewed and by whom and set up a planning process for the continuous improvement of the website.